I am an hairstylist in bethesda MD. 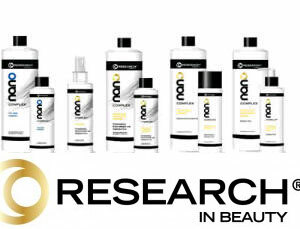 I use the Nano-Keratin Relaxer from Research In Beauty. I love the performance and the amount of formaldehyde is very low. It is 1.5% and compared to the Marcia Teixeira is much less disturbing in fact is not disturbing at all. I`ve used the marcia before I tried this one and I can tell you guys that is much better. I just had my hair straightened the safest way for the first time. I am using Marcia Texeira's treatment brand. I researched it first and am happy to attest after reading the ingredients label there is 98% keratin and only 2% formaldehyde. My hair is presently too pin straight but have been assured that when I am able to wash it this is where I will see the true results. I can't wash my hair for 4 days or tie it back these are so far the only draw backs. I would suggest you do this treatment in the winter on a Wednesday or Thursday to be able to include the weekend days to hide out. My hair is usually naturally curly, coarse, dry and frizzy. I have used none lye relaxers before and found them to leave my hair dry and damaged looking. For the past three years I have been free of relaxers and have my hair just blown out for the straight look I desire. Going to a salon weekly for blow outs is costly and when it rains forget about it. I did the BKT treatment to save money in the long run. So far I am very satisfied and will post another blog when I am able to wash my hair. I had this done a week ago and the results were GREAT! I have thick and fizzy...very fizzy hair and now my hair is not fizzy and my hair is silky and shining. This is the best thing out there especially if you have fizzy hair.